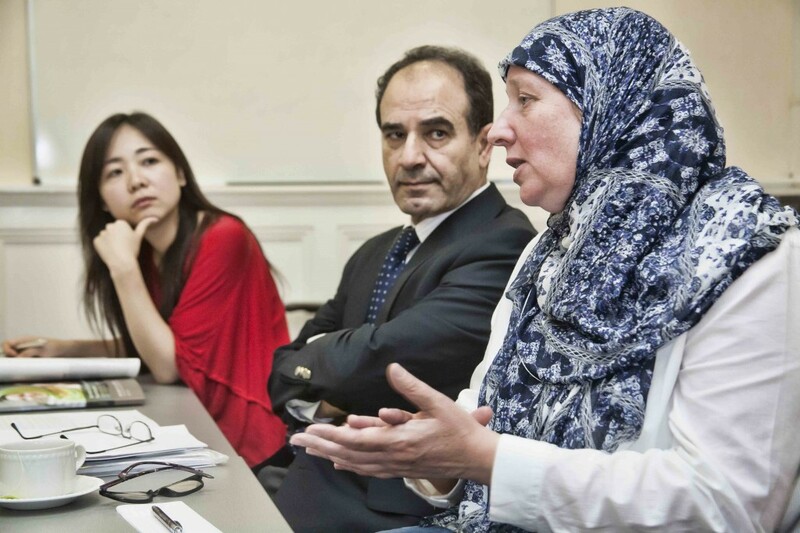 (L-R) Saeko Yazaki, organiser of the event, Professor Yasir Suleiman and Erica Timoney. Over lunch one Monday in late October, over sixty people came together to take part in an important community building event supported by Knowledge Exchange for Muslims and non-Muslims to discuss what it means to be a woman converting to Islam in the UK today. 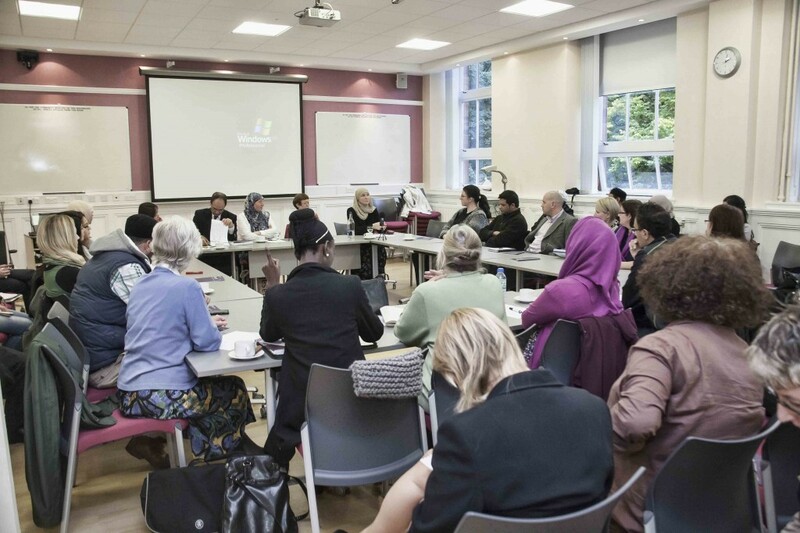 This event was organised by Saeko Yazaki, a Fellow in Theology and Religious Studies, and built on her work at Cambridge University with the Centre of Islamic Studies (which also helped to support the event). In May this year the centre launched a report based on discussions held over seven days with fifty female Muslim converts. This report has since been downloaded over 55,000 times and was also accompanied by an article in The Guardian newspaper, as well as other media attention. However, many of the comments that this article received were negative, even hostile, so the issue is worth exploring further, with new audiences, particularly to address the questions it raises in a Scottish context. 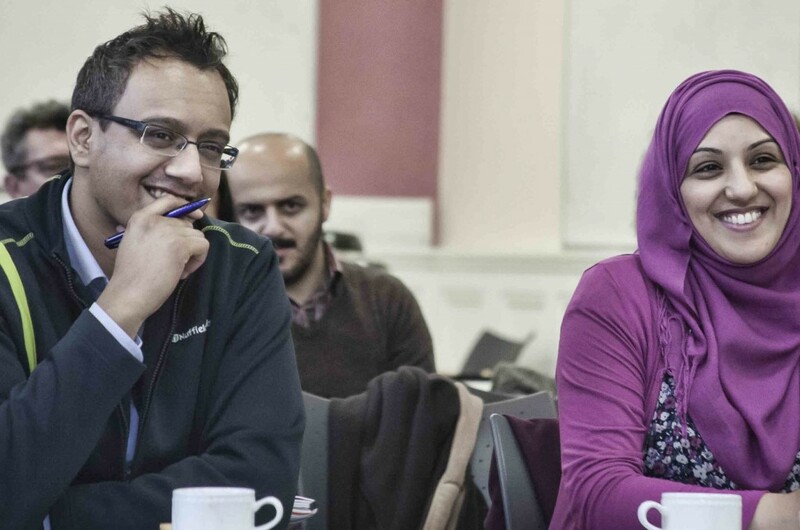 By bringing together Professor Yasir Suleiman, director of the Centre of Islamic Studies at Cambridge and leader of the ‘Narratives’ project, with two of the participants (Erica Timoney and Marion Cobban), the event managed to cleverly combine the academic with the personal. Fariha Thomas, the Labour Councillor for Govan and a Muslim convert herself, also gave her comments on the report and her own experience, bringing in the political element too. 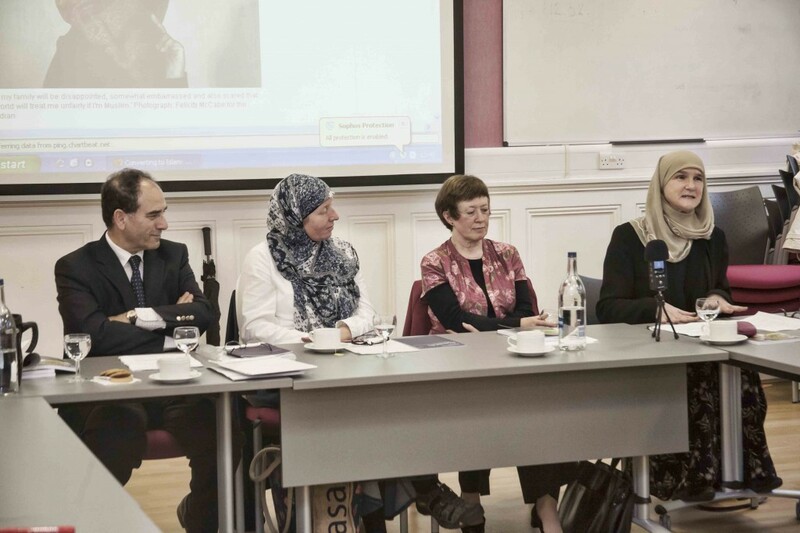 The speakers (L-R): Professor Yasir Suleiman, Erica Timoney, Marion Cobban, and Cllr Fariha Thomas. For Professor Suleiman, the project was a way to get away from what he calls ‘the numbers question’: this figure of 5,000 British people (mainly women) who convert to Islam every year. The number gets thrown around, inflated and deflated, and has become inevitably politicised. Instead, Professor Suleiman wanted to explore the issues that are intrinsic to conversion, both to Islam and to other faiths. While every conversion experience is personal and unique, belonging to the individual and shaped by, and from, their own circumstances, there were common themes and similarities that united the women across different ages, cultures and (faith) backgrounds. For most people, the spiritual element is paramount and conversion is a spiritual journey. And that word, journey, kept cropping up again and again. For some, like Marion, there was a physical journey involved: she met her husband, who was a Muslim, in Jordan. Fariha too re-discovered her faith on a train journey, reading about Islam while contemplating the English countryside. More than that, though, finding Islam was a continual process. For Erica, there was a very strong sense of continuity between being brought up a Roman Catholic and always believing in a god to becoming a Muslim. One of the common difficulties of conversion, though, was the reaction of friends, family, and wider society, who sometimes can’t recognise or understand that continuity. The three women understandably had different experiences of reactions to their conversions from family and friends. For Marion, it was particularly difficult for her friends from her former church. In Glasgow, however, Fariha has felt strongly supported by the Muslim community based around the Amina Muslim Women’s Resource Centre (which she helped to set up) and by the wider community. Having always been political ‘with a small p’, she felt the Muslim community was very accepting of her move into politics ‘with a larger p’, when she became a councillor. Constituents in Govan, she says, just see her as a councillor, not a Muslim. Part of the problem for some women involved was the media’s portrayal of Islam and of Muslim women. As Erica pointed out, this means that people sometimes have strong opinions about exactly what a Muslim woman should be – and that can be either good or bad. As converts, the women sometimes felt like they were put on a pedestal and expectations placed on them that they couldn’t live up to. Needless to say, they lived up to our expectations – and more. For the women themselves, talking about their experience was often ‘cathartic’; for others, it was an opportunity to combat stereotypes, learn about faith, and meet new friends. If you would like to become involved in Knowledge Exchange within the College of Arts, or come to one of our future events, please sign up to our mailing list or get in touch: arts-ke@gla.ac.uk. All photos by Karen Gordon.